Payson Library in Malibu will showcase the exhibit Paul Outerbridge: New Color Photographs from Mexico and California, 1948-1955 through March 15. One of America’s earliest masters of color photography, Outerbridge built his extraordinary reputation in New York during the 1930s for virtuoso carbro-color studio prints. 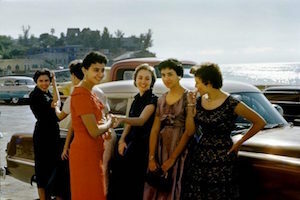 After relocating to Laguna Beach, California, in the 1940s, Outerbridge frequently took his camera to the streets, crossing the border between California and Mexico, and photographing the people and places he found. Shooting in bold, luminous Kodachrome, his photographs explore the quirkiness of midcentury leisure culture and examine the blending of two inter-woven societies at a distinctive time in history. Paul Outerbridge: New Color Photographs from Mexico and California, 1948-1955 is curated by William Ewing and Phillip Prodger. The traveling exhibition is organized by Curatorial Assistance Traveling Exhibitions, located in Pasadena, California. For additional information about this event, visit the Pepperdine University Libraries website.